A poetry publisher and vendor recommended this book to me during the end-of-conference bargain period at the US National Women's Studies Association conference, probably the year it was published. I kept it on my headboard for a few years, and made some stabs at reading in it, but never got on the poet's wavelength. Then a month or so ago, a friend sent me a link to the New York Times story about Ryan being named the new Poet Laureate of the United States. This honour is granted by the Librarian of Congress and has nothing to do with Bush, as evidenced by the statement that Ryan lives with her partner, presumably lesbian. Remembering that I had a book of hers tucked away, I plucked it from the shelf and put in a bit more effort on liking the poems, and the effort was rewarded. Ryan teaches remedial English and no great reading skill is required for this book. She uses mostly short, plain words, mixed with words she has invented for the occasion, such as kinden (for becoming more kind), and goodiary (not be be confused with bestiary). Even though the words are simple, reading the work well takes good skill for paying close attention, visualization ability, and a readiness to find a joke. In fact, Ryan's work is so practical that since she became Poet Laureate, I have taken to typing out poems of hers to send to people for special occasions. On the engagement of one couple, I sent them "A Plain Ordinary Needle Can Float on Pure Water," because I knew that these folks had gone through a long period of learning to harmonize their relationship. And to a member of my high school class (Class of '64), who made a gallant public apology for the racism he had lashed out with in his youth, I sent "Age," the poem that starts "As some people age/ they kinden." I think to Patricia Cohen, who wrote that New York Times article headed "Kay Ryan, Outsider With Sly Style, Named Poet Laureate," I might send a copy of Ryan's poem "Outsider Art." It ends with the phrase: "...We are not/pleased the way we thought/we would be pleased." But I would add that I don't mind being pleased in a way I hadn't thought I would be pleased when I first took a look at the work of Kay Ryan. 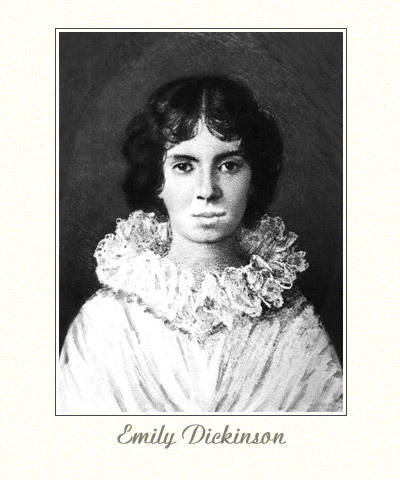 * You can see a photo of Ryan in the NYT article, and a photo of Emily Dickinson here . I confess that I had remembered Dickinson as more of a femme, but in this picture she, too, looks rather dyke-ish. I also thought of Dickinson as young, but she lived to 56. Ryan is now 62. As it stands, I believe, only three images of Ms Dickinson exist - the one you link to, the silouhette of her made famous as the long-time cover of the Johnson version of her poems (visible here, for instance), and a last one, discovered recently and in some dispute as to it's authenticity, I understand. The siilhouette would be her youngest, and the recently found one her oldest. I only intrude at all, because I'd guess the 'femme' image you mention is probably this one. Being as you're a feminist blog, I believe, I'll mention that this photo was doctored up (rather badly I might add) from the one you found, at some point in history, for reasons I'm sure you'll have many ideas about. Yeah. You know. I'll leave it at that.